Is it worth the additional marketing investment to hire a drone pilot for aerial photography and video for real estate? The simple answer is yes, without a doubt! But I would say that wouldn't I. Of course I would, since that's one of the services that I provide. In this article I will explain how video and aerial photography adds value for real estate agents. Using actual statistics, I will show you exactly how investing in services like mine can result in more money in your pocket. According to MLS statistics, homes that feature aerial photos sell 68% faster than those with traditional photos only. It makes perfect sense. 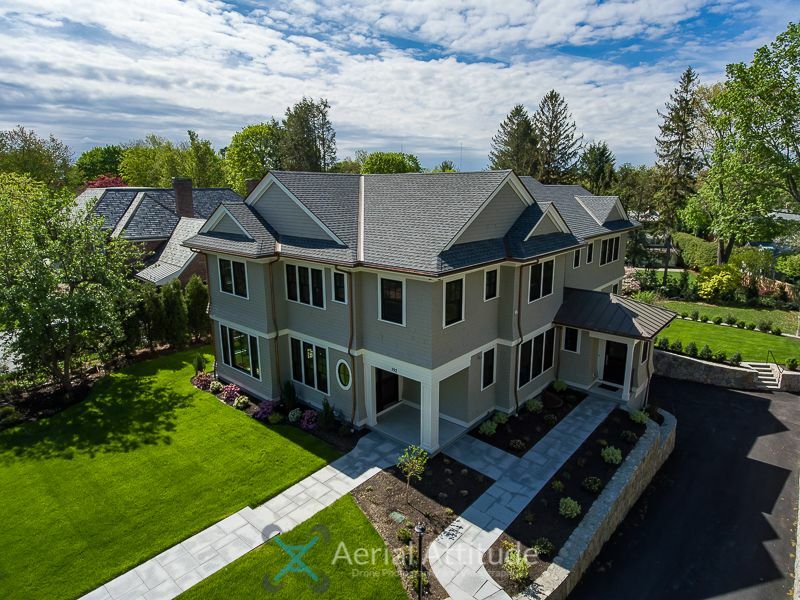 If you use an aerial photo from a drone as your MLS featured image, it jumps off the screen compared to listings with a standard photo of the front of a property from the ground. It also makes sense that agents who use aerial drone photography find that the number of listing views and inquiries increases dramatically. Naturally, the listing that jumps out off the screen is going to attract more clicks. A traditional ground based photo on the left vs an aerial photo on the right. The aerial shot is more engaging and shows a view not possible from the ground like the well thought out landscaping and outdoor entertainment space. Another aerial photo from the drone of the same property from a higher altitude and longer distance illustrates how we can show prospective buyers more unique selling points that can't be effectively shown from the ground. From the aerial photo a buyer can see the size of the block, the long paved driveway and the seclusion and privacy offered with this home. In this example, because the house is on the highest point on the property it's impossible to show any of this using traditional ground based real estate photography. Drone photography shows perspective. The seclusion and privacy of this property for example. Now let's add some stunning aerial drone video into the mix. Depending on the skill and creativity of your drone pilot, a few short video clips from the air can be captivating to potential buyers when incorporated into a virtual tour. Some of my clients find value in creating aerial overviews of a property as stand alone videos like in the example below. During open houses for brokers or the public, they will play the video on a loop on the TV inside the house. This is great especially if your open house happens to fall on a day where it's cloudy, raining or snowing. Visitors can get a feeling for what the property looks and feels like on a gorgeous day - while they're standing in the house! These videos, always kept shorter than a minute, are ideal for drumming up interest via Social Media. Post these videos on your business Facebook page, YouTube, Instagram and Twitter and ask your viewers to share them as well. You will be amazed at how many people will have a look at your listing that may have never found it before. I also post these to my own Social Media channels along with a link to your listing - an added marketing value to you. According to the National Association of Realtors - NAR, 73% of homeowners are more likely to list their property with an agent who incorporates video into their marketing strategy, yet only 9% of realtors create videos to market their listings. In April 2017, according to Realtor.com statistics in the area around Boston MA, the median list price of single family homes was $502,000 with the average being slightly over $789,000. For the same period, the average days on market was 37. For this exercise, let's be conservative and use the median list price for our calculations. The total agents commission is 6% and your brokerage gets half of that or 3% (unless of course you represent both the buyer and the seller). For most agents, this is split so you as the selling agent end up with 1.5% or $7,530 per transaction. Let's also assume that you close an average of 12 homes each year (NAR 2016 average). That comes to a gross annual salary of $90,360 before expenses (including marketing). Now that we know all of this, let's crunch some simple numbers. Let's also be really conservative with our estimates. Instead of selling a home 68% faster, I'll assume we're only going to see our homes close 50% faster. I'll apply the same 50% to homeowners who will actively look for a selling agent who uses video marketing instead of the 73% reported by the NAR. Very simply, if you can attract 50% more listings due to your use of aerial photos and video and close sales 50% faster, that means that on average you could increase your annual sales from 12 properties to 18 on average. This pushes your gross earnings up from $90,360 to $135,540, an increase of $45,180. Let's assume we work together to create stunning aerial photos and video clips to use in your marketing to achieve this increase. On average, that will cost you about $550 per listing. 18 listings x $550 is a total of $9,900. You've now invested $9,900 to make $45,180, a net profit to you of $35,280. Even if you went all out on every home and invested in a full marketing package that includes aerial photos plus aerial and interior video delivered in a full HD virtual tour ready for the MLS, your website and social media, the marketing expense would increase to $18,000 leaving you with additional net profit of $27,180. Nothing to sneeze at and an excellent return on your initial marketing investment. We know that 73% of sellers actively search out agents who use video as part of their marketing strategy. We know that listings using drone photography and video get more views and more inquiries. We know that listings that include aerial photography and video close faster. Word of mouth from your clients will attract more listings without you doing anything other than selling homes. The value of the listings that you attract is likely to increase due to your marketing prowess = higher commissions. Your reputation and that of your brokerage increases with each higher value listing you attract. By closing sales faster you not only get your money faster, your clients save money on holding costs. Take advantage of my Free Trial Offer and see what I can create for one of your listings. I will take drone photos and video of a property of your choosing and show you the results with no obligation. You can then decide on a package for the listing only if you like what you see. Contact me via email or call on 207-329-3722 to book your shoot. Thanks to Aerial Attitude for a great video. Dave is very professional and easy to work with. He approaches every property creatively and takes his time to get the right shots, beautiful videos that showcase the property. I had a property with 8+ acres and he created a stunning video that allowed buyers to visualize the entire property easily. Just want to thank Aerial Attitude for the most amazing video promoting our Holiday Park at Hawks Nest Beach. We have had so many likes and compliments on both the quality and the contents. We show every guest that arrives this video. It has been the best promotional video for our business. It truly is a complete overview of the whole area and all the beauty it has to offer. Thank you again and are recommending you to the rest of the group. Would just like to say a huge thank you to Aerial Attitude for the stunning vision you put together of our boat cruising the Myall River (Port Stephens, Australia). You truly captured the essence of our girl and the breathtaking environment we are so fortunate to enjoy her in. To say we're happy with your work would be an understatement. Professional, crystal clear images, serene waters and some cool music to boot :) Highly recommend your work! Thanks so much!! © 2019 Aerial Attitude. All rights reserved.